I shared in my P52: Shadows post last week that my husband and I had long weekend getaway to Pigeon Forge/Gatlinburg, TN last weekend. We met up with another couple who are friends of ours and had 3 fun days of double dating! My friend Molly, loves Goodwill and yard sale shopping as much as do, so we had already planned to check out ALL the thrift stores in the area while there . So Monday morning the husbands headed off to the Smoky Mountain Knife shop and the wives headed off to find some thrifty treasures. I had been scoping out the area as we drove in and knew there was a Goodwill and a local thrift store right next to each other so we hit those first. That Goodwill was the dirtiest, oldest, junkiest Goodwill ever! And their prices were outrageous! The thrift store wasn’t much better – I don’t think we bought anything at those stores. But I also knew there were several antique stores (turns out 5 within 2 miles of each other!) so we thought we might check those out. Neither one of us exactly have a “antique store budget” but sometimes you can find some yard sale prices in an an antique store – it just takes some looking! We kept our eyes peeled for booths that said “50% off”! Lot and lots of glassware! I had my eyes peeled for some turquoise glassware to add to my dining room and I loved these pieces but they weren’t in my budget. Crates and baskets like these are a huge thing right now for organizing stuff in your pantry, magazines, blankets, etc. We saw quite a few but none at the price I was willing to pay. Huge mirrors like this are a great find! The frames are usually plaster or plastic and easily paintable. The mirror I used for my outdoor self-portraits is almost identical to this but I got mine under $10 and this one was much more expensive. Lots of tin cans, enamel ware. Price at this antique store – $59.99! I was in love with all the milk glass!! it was everywhere! Some very reasonably priced, some way overpriced! We stopped in a little crafty home décor store and we both loved these cabinets! They were handmade and very rustic looking with just basic wood, but the doors were all old windows! I loved the black cabinets! One day, I might get inspired to try to make one of these cabinets. I just loved them. This entry table or potting bench was unique too. See what the back part is made of? An old door! The top looked like it made me made from the back of antique child’s desk and the bottom part was the other part of the desk. This store turned out to be our FAVORITE store and the one where we both bought baskets of treasures! We walked in and both looked at the crystal chandeliers and said “This is another store that is going to be out of our budget.” But we looked around anyways. Turns out up those stairs was a gold mine of a booth! See that price on that bottle – $0.10!! Oh yeah, yard sale prices! And this booth was FULL of stuff and prices like that! We were literally crawling around on the floor digging under tables to find stuff! Molly posted a picture of me to prove it! $4.00 for pretty candy dishes, instead of $59.99! This frame was HUGE (and would have been awesome spray painted white or a fun color!) and only $2.00 and I just about snatched it off the wall. But then I saw the damage on the corners (see in the bottom left corner)? Wasn’t sure if that could be repaired so I left it. Found these pieces at another store. Think the small one was $2.00 and the large milk glass bowl was $5.00. Has anyone tried recovering a lamp shade? The shade has a really heavy duty metal frame, but not sure how to go about recovering it? Might just scrap it? 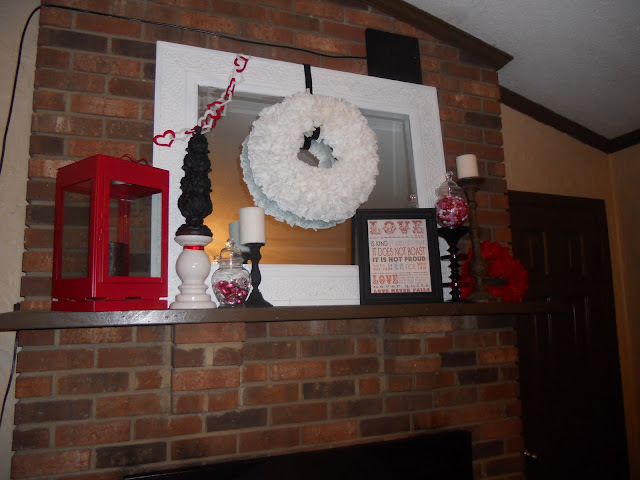 Molly went home and used a lot of her finds to decorate her Valentine mantel. Such a fun weekend! Fun fellowship, shopping, thrifting, crafting, games, and more! Oh, and by the way – the husbands spent much more than our thrifty finds at the knife store! Have you had a fun thrift shopping day recently? If you have posted some fun finds, link them up in the comments so I can pop over and see! Oooh! Love all your finds!! I need to remember that store b/c we go to PF a lot! Love all that milk glass! And so much fun to have a shopping partner too! Renee @ Living, Laughing, & Loving recently posted..Menu Monday! Slashing the Food Budget! Thanks for posting about your shopping in Pigeon Forge. I googled to see if I could find locations of some thrift stores in that area. Going next week with some friends and love to go shopping at Thrift Stores and also Antique stores. THANKS so much for your post. Enjoyed looking at the bargains you found. Just happened upon your posting while looking for thrift stores in that area, girls weekend coming up and we ALL love ‘junking’. Thanks for all the info. We are going there next week on vacation and I look forward to going to these stores. What was the name and Location of Thai last thrift shop?